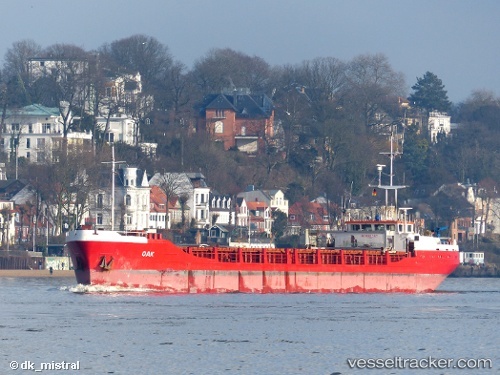 On Feb 4 the "Oak" was being taken along the Göta River from Lilla Edet to Gothenburg assisted by the Danish tug "Sound Castor (IMO: IMO:8977065), and the Swedish "Hugin (MMSI:265512660). The ship berthed in the Aelvsborgs Port at 1.30 p.m. and at Tingstadsvassen on the Göte Alv on Feb 15 at 10 a.m. On Feb 18 she was docked at the Gotenius Yard for repairs. She left the repair yard in Gothenburg on March 7 at 11 a.m. and headed to Police, Poland, with an ETA as of March 9, 4 a.m.